Last month, Interview magazine successfully managed to gain our attention with its jaw-dropping Nicole Kidman cover. 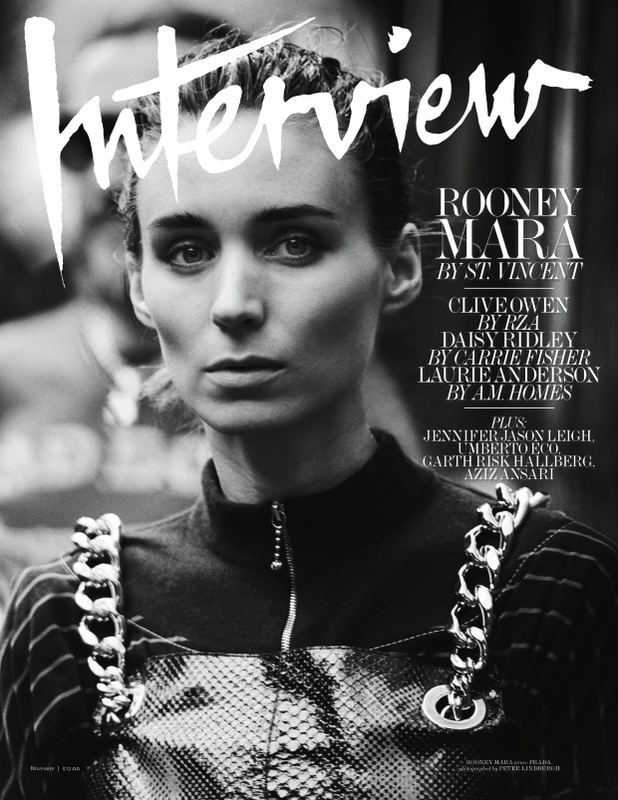 Now moving on to the release of the November 2015 edition and continuing with the black and white cover shots, Rooney Mara becomes the title’s new cover subject. The Carol and Pan actress meanders the streets of London wearing Prada with photographer Peter Lindbergh in the visually stimulating portrait that has our forums in a pickle. Members of our forums quickly jumped into a debate. “Their best cover in a while…There’s a strength to the image despite it veering towards predictable Lindbergh fare, and I think a lot of it has to do with what she’s wearing,” admired Fiercification. “Only a fantastic face like Rooney’s can pull off a raw cover shot like that,” added Marc10. Not all of us were feeling it, though. “Horrible!! Possibly the worst cover I have seen from Interview, ever!” declared Miss Dalloway. In agreement of how horrific the cover turned out was mepps. “This is their worst cover all year, and possibly last year. The pictures aren’t bad, but they are as dull and lifeless as Rooney Mara always is,” he replied. “This girl has absolutely no expression in her face,” pointed out an underwhelmed honeycombchild. Eek! Take a peek at Rooney’s cover story to solidify your own opinion and drop us a comment here.